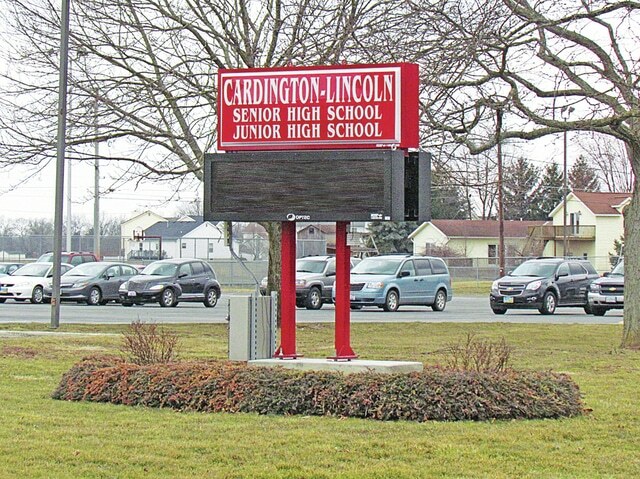 When the Cardington-Lincoln Board of Education met in regular session on June 8, members unanimously approved the Tomorrow Center Sponsorship Agreement. This is in reference to the Center’s anticipated move to the Cardington-Lincoln Intermediate Building. 1. The five year agreement for Sponsorship (July 1 – June 30, 2020), may be terminated early upon mutual agreement. 2. Primarily operates for grades 5-12 with approximately 120 students. 3. Board membership of five members (four members are sitting, one seat is currently vacated) Two year terms. 6. Fee for Sponsorship (3% of base State per pupil foundation) for FY15=$33,600. 7. Liabilities: both the Tomorrow Center and the District are required to have insurance for the building whether the students are Cardington students or Tomorrow Center students. Before voting on the establishment of administrative salary schedules for FY 16, board member Vicki Kerman stated her opposition and read a letter to the board. Noting that she had voted against the administrative schedules last year, she cited the same reasons for her opposition to the measure this year. She had voted against the measure on both the three year certified and classified agreements because of her concern given the district’s financial projections. The earned income tax levy has helped somewhat, she said, but the five year forecast approved last month shows the projected finances to be tight at best. The measure was approved on a 3-2 vote. Joining Kerman in opposition was board member Marilyn Davis. Before voting on the individual administrator contracts, Kerman read a letter noting her opposition to them, each to begin on August 1, 2016. She noted the current contracts guarantee the administrators will be able to serve the entire coming year. State law requires the administrators be notified in the year that their contracts expire, in this case, next year. She said the board has historically voted to renew or non renewal these contracts one year in advance of the state requirement. She listed four reasons that she thinks this is not appropriate. 3. While the contracts do not contain salary levels they do contain terms outlining retirement contributions made by the district – which have financial implications – we do not have a firm grasp on what the district financial position will be. 4. The ODE releases its report card results for the just ended school year in October-November – these results are important in evaluating district performance. To be deciding on these contracts now would not enable taking these results into account. She feels it is more prudent to consider these contracts next February. She made a subsidiary motion that the vote on these contracts be postponed indefinitely. Voting against the motion were board members Pat Clark, Jim Clinger and Chuck Jones. Voting “Yes” were Marilyn Davis and Kerman. Supt Petrie noted the effort that these administrators are working in hours and effort sometimes 16 hours a day. He said he has a lot of confidence in this team, adding it is in line with districts in the area and it is a realization it is not easy to find or replace them. Three year contracts, each beginning August 1, 2016, were unanimously approved for Jennifer Zierden, director of Digital Learning, assistant principal; Christy Roqueplot, K-6 Principal; Scott Hardwick, director of Pupil Services/K-6 assistant and Joseph Mills, 7-12 principal. The board approved the position of assistant to the treasurer, effective June 9-July 31, 2015 for Darla Hardwick, up to 30 hours per week. Under the Consent Agenda, the board accepted the resignation of Colleen Biederman, high school guidance, effective June 19, 2016. New certified staff employees approved were Ellen Haldeman, 5th grade; Bryan (Colton) Bowers, K-12 Art: Chelsea Rockwell, second grade, and Angie Hildebrand, preschool. Each was approved for a one year contract beginning August 11, 2015. The following supplemental contracts were approved for Fiscal Year 15: Beau Wolford, high school football assistant coach; Marty Barnett, assistant athletic director and Tonya Bonnette, 7th grade volleyball. Pupil Activity contracts (non teaching) were approved for Scott McKenzie, Andy Ratliff and Jake Williams, each high school assistant football coach; Jeff Maibach, eighth grade football; Shane Chapman, seventh grade football; Terry Lichtenberg and Ron Pine, volunteer football; Lori Vance, JH cheerleading advisor and Varsity cheerleading advisor, (.125FTE); Bill Clauss, Athletic Director; Dale Barnett, Volunteer assistant athletic director; Joey Reed, Volunteer JH Cheerleading advisor; Erika Votaw, JV Volleyball coach and Amanda Allen, freshmen volleyball. Classified staff members employed for FY 16 were Crystal Spires, one year limited as an aide and Carol Mosher, continuing, as secretary. Classified substitutes employed were Brock Sherman, Randy Miller and Andrew Orecchio, each as custodians. Extended Contract Days/Hours for Fy16 approved included Jerry Williams, dean of students, 20 days; Erin Wollet, Agricultural Ed, 40 days; Krista Betti, Agricultural Ad, five days; Erik Kyrk, technology, 20 days; Katie Porteus, library, eight days; Mindy McGinnis, Aide (library) up to 40 hours; Christy Short, Aide (tech) up to 40 hours; Greta Kanagy, Guidance, 15 days and Angie Bush, family/consumer SC, eight days. Leave of absence was granted Marty Minturn from June 8, 2015 to June 7, 2016. Approval of hours for special education ESY (Extended School Year) June 1-August 8 were granted Kylee Wager, aide and Carrie Jeffrey, teacher. The Resident Educator Mentor Stipend was approved for Angie Bush. – Nursing Services with Morrow County Health Department at $18,460. -Bus Maintenance Services for Fy 16 and Fy 17 (two year contract) were approved with Mattix Garage at $55,586. a year. The following lunch prices were approved for the 2015-2016 school year: Intermediate: $2.75; Elementary:$2.50; Junior High and High School: $2.75 . Supt Petrie announced that $2,000 had been given to the school’s 2015 Summer Feeding Program by The Bread for All People Program. In a letter from Adam Sornchai Pastor of St. John Lutheran Church, and Deborah Noll, Bread for All People Coordinator, it was explained the money was awarded through a grant from Zion Lutheran Church, Waterville, Ohio. Supt Petrie also said that Buckeye Health Plan has donated supplies for 100 students that included a bag full of fun things. Before the regular meeting began, the board entered a 25 minute executive session based on ORC121.22 (G) 1, 2, 3, 4, 5, and 6. the employment of a public employee or official and reviewing negotiations with public employees concerning their compensation or other terms and conditions of their employment. Board members extended their well wishes to district treasurer,Scott Osborne, whose resignation is effective June 30, 2015. The board will meet next on Thursday, June 25, 2015 at 7 pm.